NYPD Officer Charged In Connection With Videotaped Biker Attack : The Two-Way Investigators say undercover and off-duty officer Wojciech Braszczok was part of a motorcycle group that attacked the driver of an SUV. An undercover New York City police officer has been arrested and charged in connection with the beating of an SUV driver last month by a group of motorcyclists. The attack was videotaped and went viral on YouTube. 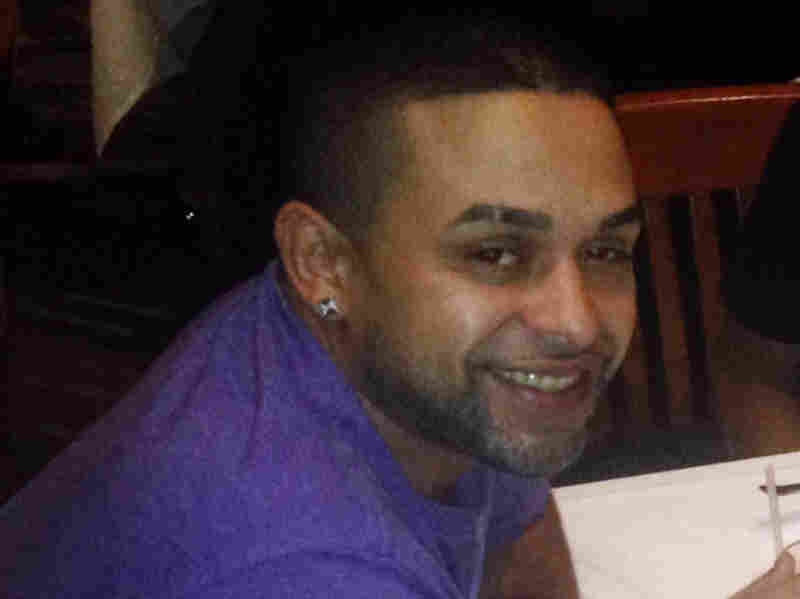 Edwin Mieses Jr.'s family provided this photo of the motorcyclist struck by an SUV during a rally in New York last month. Doctors put Mieses in a medically induced coma. Wojciech Braszczok, 32, was part of the motorcycle rally on Sept. 29. As The Associated Press says, the rally "began with a reckless motorcycle group ride on a Manhattan highway ... [and ended when] one motorcyclist was run over, and the SUV driver was dragged from behind the wheel and beaten on a street." New York Police Department spokesman John McCarthy confirmed the arrest. The AP says NYPD internal affairs "began looking into the undercover detective's conduct because he didn't report having been at the rally until three days later. The expectation that police officers will act if they see crimes isn't the same for undercover officers." The New York Post says video evidence allegedly shows that Braszczok, who was off-duty at the time of the incident, "shattered the window [of the SUV] with his gloved hand." "Braszczok told authorities that he pulled up toward the end of the beating, leaving him no time to help victim Alexian Lien or his terrified wife and 2-year-old daughter in the SUV, sources said." Lien, 33, had bumped a motorcycle. In the video, other riders then surround Lien's Range Rover, possibly smashing a window. "There was no immediate response to phone messages left with Braszczok's attorney, Phil Karasyk. He had previously said the 10-year NYPD veteran only witnessed other bikers attacking the vehicle." As The Two-Way's Mark Memmott wrote last week, "moments later, Lien drove off — striking at least one motorcycle rider ... Edwin "Jay" Mieses, who sustained serious leg and back injuries and was placed in a medically induced coma. Last week we reported that one of two male bikers taken into custody earlier had been released by authorities. The second, Christopher Cruz has been charged with reckless endangerment and child endangerment.